Suspension components can dry and wear on the Toyota Tundra, which can cause various types of noises. Read on to learn how to diagnose any suspension issues. This article applies to the Toyota Tundra (2000-present). The Toyota Tundra is a hard working truck, designed for heavy duty work, but with heavy work comes heavy stress on the suspension. Depending on the driving conditions you drive your truck in, the weather conditions your truck sees, or any incidents that happened that could hurt your suspension, some of the components can fail, which could cause your truck to handle differently or make different types of noises. Read on to learn how you can diagnose the suspension system of your Tundra. 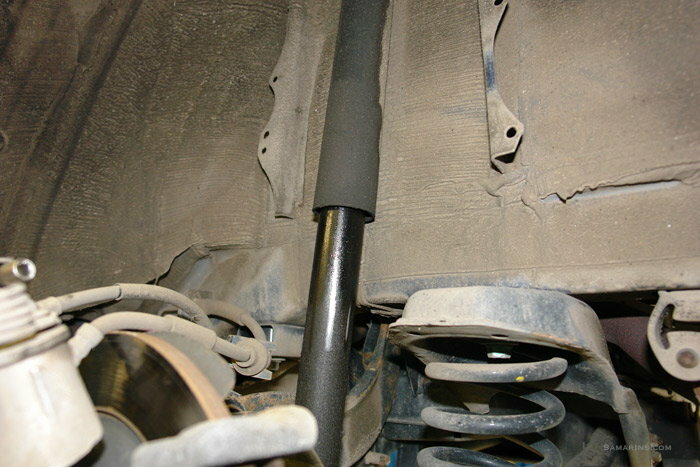 The shocks on your Tundra can fail for many reasons. Whether you haven't replaced them in a while, or you've put too much stress on them, there are two ways to diagnose the shocks. The first way to find out if your shocks are bad is to visually inspect them. Inspect your shocks for any oil on them. A faulty shock would start leaking oil, so if you see a change in color on the shock, then you may be due for new shocks. The second way to check it is to go to the shock that you think is faulty, press down on the truck, then let it bounce up. A good shock will let the truck go right back to position without bouncing up and down, while a bad shock will allow it to bounce a few times after. If the shocks are working properly, proceed to Step 2. They could be broken or rusted. The coil springs can take a lot of beating on the Tundra. However, they can also break if they go through too much stress or rough driving conditions. Rust is another enemy of coil springs, so if you live somewhere where rust is common, this could definitely affect your coil springs. Inspect the springs for any cracks or rust; if you discover any, be careful when replacing the spring, as you need a special tool to compress it. 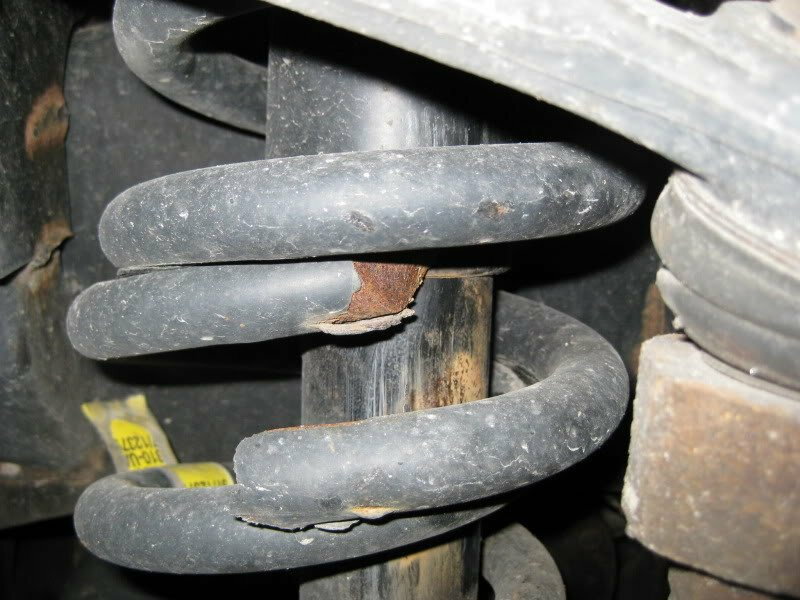 A cracked coil spring can cause creaking noises when going over bumps. Figure 2. Cracked and rusty coil spring. If the coil springs are in a good condition, move on to Step 3. They could be worn, cracked or damaged. The bushings are little rubber components that go between your various metal suspension components. They are not designed to live forever, especially if you live in an area with rough weather conditions. 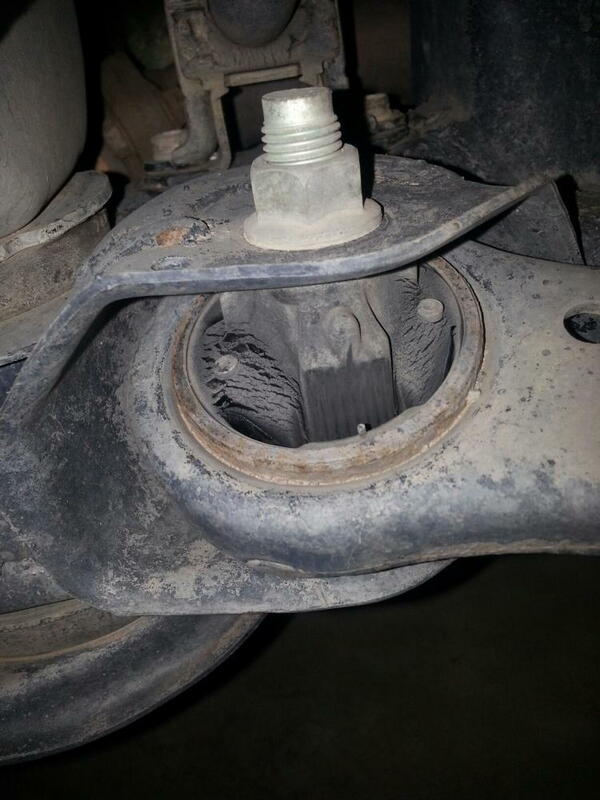 Sometimes you can experience worn bushings, which are quite common for trucks, and other times they can crack and fall off, in which case you will experience loud noises that indicate your metal components are grinding together without the rubber in between. Use your flashlight to check all the rubber bushings between your suspension parts, your shocks and the control arm, and inspect them for dryness and cracks; or, check if they are even there. On this platform, the most common culprits are the upper shock mounts, control arm bushings and frame mounts. Figure 3. Worn control arm bushing. Toyota Tundra: Why is My Frame Squeaking?